I can be the most laid back, flexible person most of the time. I don’t mean to make myself sound like I’ve got it all together or like I’m just so awesome I’m flexible all the time; but I’m typically pretty flexible. When with friends, I don’t mind going where they want to eat instead of where I want to eat. At work, if I am needed on another project or another space, I don’t mind moving. Easy, simple things like that I can be INCREDIBLY flexible for. But the more I truly know myself, the more I realize that I am a bit of a control freak. It’s not that I have to be in control of every situation, or that when a problem needs to be solved it has to be done my way, but rather I’m a bit of a planner. And by a bit of a planner I mean I’m really a planner….like I already have my morning figured out tomorrow and I know what errands in what order I will run tomorrow after work. A friend and I are planning a vacation in October and I’m like OCD planning and finding fun things to do–and it’s the most exciting thing in the world. I like to plan out my days and I have my life planned out, too…except that the way I thought my life should go when I was 20 didn’t exactly work out. In fact, if you had told 20-year-old-me all the things I’d have done and places I’d have lived since then I would have laughed. And then I probably would have had a nervous twitch because it SO wasn’t how my life was supposed to go. A very wise woman I know lives her life in such a way that she gives everything, every plan completely to God. She felt God calling her to move to another country, so she prayed about it, began pursuing the means to make it happen, and asked God to close the doors if it wasn’t His Will. Things fell through and doors were closed, but the door to move wasn’t closed. She still moved and God provided, it just wasn’t in this neat and tidy plan that I would have concocted. And it probably wasn’t the way she expected it to happen but she was willing to to give it completely to God and asked him to shut the door if it wasn’t His Will. I was talking with a friend recently who was faced with two paths; to stay on the path she had or to take a new job and a new path. I excitedly told her the story of my wise friend asking God to shut the doors if it wasn’t His Will. But I don’t know if I could truly ask God to shut the doors if it wasn’t His Will. I don’t know if I could tell God, “This is my plan, this is how I see it, shut the doors if it isn’t your will.” It terrifies me to think of it, what if the deepest desires of my heart don’t come true? What if the amazing, mystical plan I have for my life isn’t God’s Will? I have this need to be in control. Such a need that I struggle with asking the God of the universe, the God who created me, the God who so awesomely orchestrated the last 29 years of my life–including plans I would have shuddered to think were for me–I struggle with asking God to take my plans and close the doors if it isn’t His Will. In reality, God’s will will prevail. 10 years ago I never would have thought that I would have been a camp counselor, I was too shy, there was NO WAY that I would have planned that. But God did, and it was one of the greatest things ever to happen to me. God hasn’t let me down yet. The plans I had that haven’t come true, have been replaced by even greater life events, even greater life paths, but I still struggle to give up my dream life plan. I’m a control freak. I’m a broken, sinful, control freak without knowledge of the big picture and yet I think my plans just might be better than God’s. It terrifies me to ask God to start shutting doors if they aren’t His Will. And yet I claim to trust Him, I claim to follow Him, I claim to love HIm. God promises that He has a plan for our lives. He promises to be there with us. I love God. I love the plan He has had for me. I love looking back and seeing how His plan prevailed over mine, and how His plan was truly more awesome than the plan I had for me. So I’m a planner, a control freak, throwing that all to the wind. Throwing it all to God, to the one who created me, who loves me more than I can ever imagine. And asking God to close the doors if it isn’t His will. I’m sure I’ll try to take back my plans. But in the end, I know that His plan is FAR better than mine. In the end, I trust Him far more than I trust myself. Close some doors. Calm my fears. Show me your plans, for you, oh Lord are my strength, my shield, my King. Every friday over at Lisa Jo’s blog is a big blog carnival called Five minute friday.To participate write for 5 minutes flat with no editing, tweaking or self critiquing. Lisa Jo’s topic this week is: Beloved. I was once a part of a group called Beloved. We were an all girls group specifically reaching out to other girls. We talked a lot about how we are God’s beloved. So fitting to write on this on the day after Valentines. We are loved by a God who is so big. We are significant to a God who created all people, all creatures, the earth. I love to think of looking down from a mountaintop at a town below, or down at towns from the window seat on a plane. It puts it all into persective how tiny, how insiginificant we are in the grand sceeme of all the people and creatures of the world. I AM a big deal. I love the imagery that if I was the only person on the earth who needed saving, God still would have sent his son to die for me. Join this Blog party here. My first year of college I met some crazy people. I learned that girls are catty, super catty. I learned that our dry campus was so dry you could swim. I learned that chapel every day was pretty much the same every day (a lesson I quickly unlearned a few years later) And I learned that some christians are pretty extreme in their beliefs. I met a girl who said that she couldn’t worship in a place which didn’t have a cross. 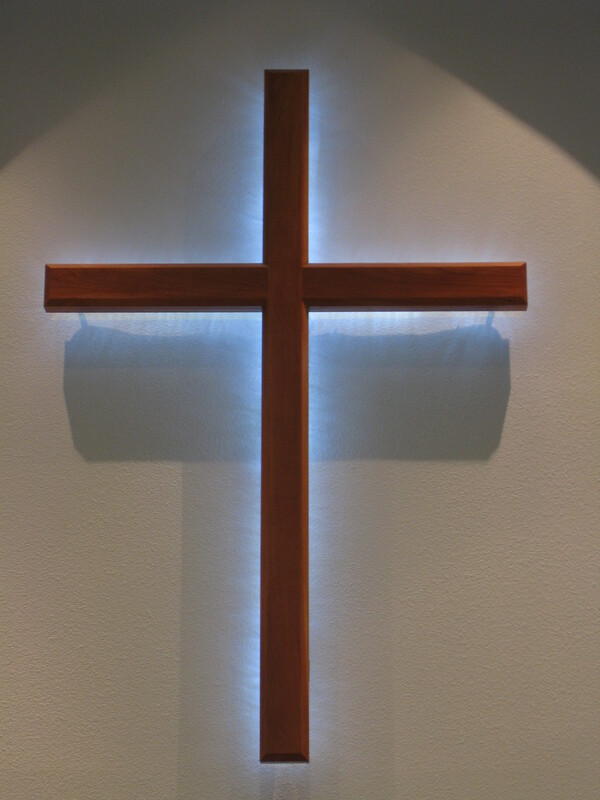 She tied so much of worship to the cross and saw a huge importance to having this symbol around during worship. I began to think about this, and still sometimes ponder this, is it possible to worship the cross as an idol– to have idol worship of a cross? Can we not worship God in nature? In majestic mountain ranges, in vast and barren deserts or fruitful and plentiful fields? Can we not worship God at the presence of an every day miracle: the birth of a child? Where is the cross in all of this? What about churches which don’t have a church home? Must christians who gather to praise and worship God also make sure they have a cross with them? Recently I heard talk of a church which doesn’t openly advertise their denomination. You wont see Methodist, Baptist, Catholic or Lutheran written on any of their paperwork. A friend visited the church and was turned off by this. They couldn’t imagine worshiping at a church which didn’t advertise which church they belonged. Can this be “idol worship”? Maybe it’s a stretch, but my question really is: Whats important when it comes to worship? And at what point does insistance on a name or a symbol become Idol worship? Life has been crazy lately. I left my job and moved back home. It’s a long story, but it’s 100% what God wanted me to do. The last few weeks were filled with tearful good byes, last minute work meetings, and packing. Lots of packing. I’ve been catching up on sleep– I slept from 10pm until 11am just about every day since getting home until Saturday. It all began Saturday night. I began getting tired at 10 and went to go to bed. And then 11 came by and I was still up. My brain would not stop. So I turned on some old school reruns and decided to wait until I was tired again. And I was still awake. So I grabbed my computer and began filling out some applications and responding to emails. And I started getting tired. And 1 came around, but still sleep teased me. 2 o’clock and I finally decided I’d lay there still all night if that was all the rest I’d get. It was probably 3 before I finally passed out. Sunday night about 11 I decided to try to go to bed. But still I could not sleep. And it’s been late night after late night ever since. I’ve finally started waking up around 8 or 9 no matter what time I finally pass out so here’s hoping that helps re-correct things. It got me thinking how our bodies were created to live in this rhythm of rest and go rest and go. But this rest doesn’t just apply to sleep. It also applies to our faith. In particular to our faith when we intend to let God rule our lives, to live our lives in service to Him. At school we always talked about it as this glass. We go to church, Bible study, and pray to fill up that glass. And as we serve, teach, and witness to others, that glass gets emptier and emptier. We need to continually refill our glass so that we can fill others. I always notice when I’m out of that rhythm. I am more agitated less at peace, and I’m pretty sure it’s got something to do with so much and so little sleep I’ve gotten. We are meant to live our lives in a rhythm. Are you living yours in a rhythm? Or are you in a spiritual Insomnia season?